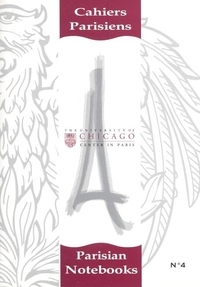 The "Cahiers Parisiens/Parisian Notebooks" publish selected papers in English and French drawn from international conferences held at the University of Chicago Center in Paris. This fourth volume contains papers presented during the academic year 2006 07. Proceedings of the following conferences are part of this volume: Marx in the 21st Century, Cervantes and France, Dictionnaires Monolingues et Bilingues: Langue, Culture, Litterature, Modernites de Perrault, La Souverainete entre les Anciens et les Modernes, Machiavelisme/Anti-Machiavelisme: Figures Francaises, and La Biographie des Ecrivains a la Renaissance. "